The Police Response Team (PRT) of the Royal Solomon Islands Police Force (RSIPF) has killed a total of three crocodiles during separate operations in the Western and Central Islands Provinces since 13 January 2018. “Following the attack by a crocodile on a seven-year-old boy from Voloa Village last month, I requested the PRT to mount an operation in the area to get rid of the reptiles. The operation included setting up of crocodile traps and patrols,” says Supervising Provincial Police Commander, CIP, Inspector Hugo Maelasi. “I am happy to say that the operation has been a success after members of the PRT killed two crocodiles on 16 January at a village near Tulagi. One measured 5.5 meters long and another three meters,” says Inspector Maelasi. He adds: “I want to thank the community leaders in the villages where the operation of the PRT has been carried out for their assistance and cooperation with the Team. At the same time I appeal to people who live alongside river creeks, streams and coastal areas to always be on the lookout for these dangerous reptiles and report any sightings to the police. 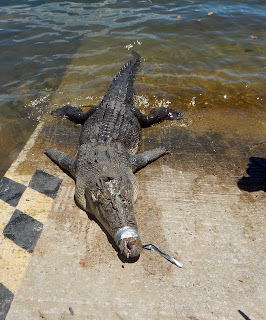 Meanwhile, another PRT operation had killed a 3.5 meter crocodile at Barasepo Village in the Vona Vona Lagoon on 17 January 2018. This came after setting up crocodile traps in the area from 16 January.